The kitchen is perhaps the most important part of the house for all foodies. But it is for people who actually cook that the kitchen is so much more than just a cooking space. Modern kitchens are now carefully crafted as the size of houses and thus kitchens shrink. The focus now is on optimum utilization of the available limited space. There are many items and fixtures which can now do this with ease. All you have to do is choose the right mix of all for your kitchen needs. One such fixture which is discussed in this article is the corner kitchen cabinet. What are corner kitchen cabinets? As you can guess from its name, these cabinets are designed mainly for the wasted corners in kitchens. Corner kitchen cabinets are ideal storage options and can be installed easily. It helps you solve the perennial problem of where to keep what. There are dishes, utensils, cutlery always lying about despite all the racks and shelves. A corner kitchen cabinet is mostly used for storing things you do not use daily. So stow away those soup bowls which are used once in six months. This will also help you organize the kitchen efficiently as you will know exactly what is where once you have stored your daily items in regular shelves and unused items in the corner cabinets. You will soon notice how much more workspace this gives you. A corner kitchen base cabinet is usually a better idea as it is more within reach than the corner kitchen cabinets on the wall. Many varied styles for corner kitchen cabinetry exist in today’s versatile market. The costs would vary depending mainly on the material used and then on the style. Check the advantages and disadvantages of all the available materials rather than going in for one which looks good. Another useful tip is to maybe have a rough idea of what you want to keep in these corner kitchen cabinets before purchasing. These will help you decide faster automatically as well as not confuse you later. If you are one who is finicky about how the kitchen looks, then too, corner kitchen cabinets are great ideas for you. If done aesthetically they can really add to the look of your kitchen. The best part is that with the corners filled out with these cabinets, there will be no abrupt ends adding fluidity to the space. The standard corner kitchen cabinet dimensions might not always be suitable for your needs so it is advisable to go in for custom-made ones. They might however cost a little more than the factory made one. Another great option which might be a little easy on your pocket is the semi-custom made type. In this the standard factory size is maintained but certain changes can be made to adapt it for you. One more kitchen item that needs to be mentioned alongside these cabinets is the sink. For kitchens in L or U shapes it is best to install the sink in the corner. With this you can also go in for the corner kitchen sink cabinet underneath for all the pipes and drainage requirements. The main thing to remember is that the cabinet needs to have a top going up into the corner of the wall for it to be able to support the dishwasher. A cabinet of plywood or made of particle board would be highly suitable for this. 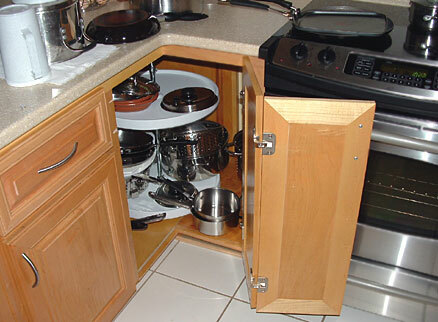 One extremely popular device often made use of in these corner kitchen cupboards is the Lazy Susan. This is essentially rotating shelves inside so next time you are looking for the special salad grater all you have to do is swing the Lazy Susan around and come to it. Within this also many designs exist like the half moon or a pie shaped rotating shelf. Now that you have most of the lowdown on corner kitchen cabinets you can think about remodeling your old style kitchen and do it up in the contemporary style very easily. I am considering redesigning my old kitchen. I like many things in it but I don’t have enough space to store all of my kitchen utensils. I think corner cabinets in the kitchen are very convenient but can easily get cluttered.